An urgent debate is raging about the appropriate posture to adopt towards the Assad regime. As Britain’s Foreign Secretary Jeremy Hunt acknowledged: “We do think he’s going to be around for a while.” After 2011, several Arab states downgraded their diplomatic representation in Syria without fully cutting ties; for example, Bahrain retained a consulate in Damascus. Low levels of two-way travel and interaction never entirely ceased. Is there now a case for a conditional process of re-engagement? It would be tempting to base Syria policy on red lines and inflexible principles: The Assad regime is responsible for shocking crimes against humanity and lacks legitimacy on all levels. However, regional geopolitical realities compel us to consider the wider picture. Arabs shouldn’t look to strategic leadership from the West. Donald Trump, during his election campaign, espoused confused ideas about Bashar Assad being an ally against Daesh. His disastrous demand for US troops to immediately depart Syria appears to have softened slightly, but might that all change with the president’s next Twitter tirade? After 2003, Arab states, with well-founded justification, kept a principled distance from the new Baghdad leadership. The new Iraqi regime under foreign occupation (which most Arab states had strongly opposed) enjoyed questionable legitimacy, while the incompetence of America and its allies empowered political figures closest to Tehran. Fifteen years later, this Arab refusal to engage was obviously a catastrophic mistake: Iranian interference went from strength to strength, Sunnis and moderates have been marginalised from Baghdad’s political process, and a succession of terrorist forces imperiled regional stability. Looking at the bloody facts of events in Syria since 2011, our hearts tell us to repudiate and ostracise Assad. However, our heads tell us that he is going nowhere and, for the sake of regional stability, neighbouring states cannot afford to detach themselves from developments in this nation, which itself has traditionally been the beating heart of the Arab world. Arab parties have long been excluded from negotiations concerning Syria’s future. This must not be allowed to continue. This doesn’t mean condoning or forgiving Assad. Furthermore, many Arab states keep their distance knowing that this is a puppet regime, manipulated by powerful Iranian “advisers” like Qassem Soleimani, who micromanaged the conflict. 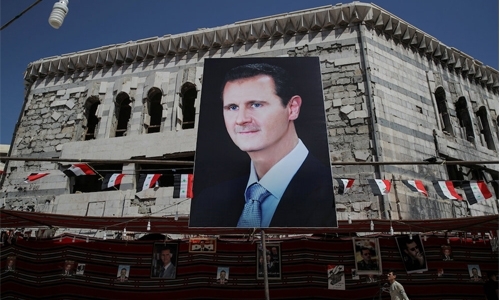 Even before 2011, Assad was a malleable figure dominated by gangster-like family members. The reason Moscow and Tehran want to retain him in power is not because of his personal strength, but because he is a weak vessel for deeply entrenched interests. Gulf states should not start pouring billions into reconstruction unquestioningly. This criminal regime would seek to divert such funds, while Iran is lobbying to enrich itself from reconstruction contracts, despite having scant expertise to offer. Arab states should exert diplomatic leverage through other means. In March, the question will arise as to whether the regime should be readmitted for the Tunisia session of the Arab League. Member states can wield powerful influence in mapping out a path for allowing Damascus to conditionally re-engage with the Arab world. In Syria’s political process, Russia and Iran seem determined to force through some form of farcical electoral exercise, though any credible candidate who could challenge Assad obviously won’t be allowed to participate or win. Half the population is displaced and significant territories lie outside regime control. A very senior Lebanese politician told me that he was keen to see Syrian refugees returning; but, when male returnees face detention, torture or worse, it is right not to push this agenda too hard. Arab engagement could provide a framework for genuine reconciliation and a return to political life, reintegrating dissident political forces and brokering a more inclusive political process, while recognising that the kind of revolutionary changes envisaged by oppositionists are off the table for the foreseeable future. This is a moment for making the best of current realities, irrespective of what we would ideally wish for. Trump’s posited withdrawal puts Turkish and Iranian interests diametrically at odds in the battle for eastern Syria. Likewise, Russia has been increasingly discomforted by Iran’s efforts to dominate Syria, particularly given the risk of triggering a conflict with Israel, an important ally for Moscow. Turkey, Russia, America and even Israel could thus all see it as in their interest to squeeze Iran out of Syria in favour of the Arab League — even Assad once enjoyed styling himself as an Arab nationalist. The problem is that the Arab world is often its own worst enemy. It is rare to see co-ordinated, well-executed diplomatic initiatives followed through to fruition. Unilateral, piecemeal re-engagement — such as the UAE and Sudan upgrading diplomatic ties — act as propaganda wins for Assad without exerting leverage for the regime changing course. Arab states have been smart in cultivating ties with Moscow, but they should now muscularly lobby Vladimir Putin over Syria. A collective Arab proposal for a programme of re-engagement, conditional on Syrian strategic realignment, must be too good to refuse. Now is thus the moment for the Arab world to take the bull by the horns and forcefully involve itself in resolving the Syrian conflict, asserting its rightful place at the negotiating table, while spelling out to Assad why his higher interests lie in realigning his strategic relationships. The Damascus regime could remain shackled to a fragile, isolated and hated Iranian regime, economically weakened by international sanctions, or it could reopen the doors to the wealth and capacities of Gulf states and the wider Arab world. On the face of it, there seems only one viable path for the Syrian Arab Republic.